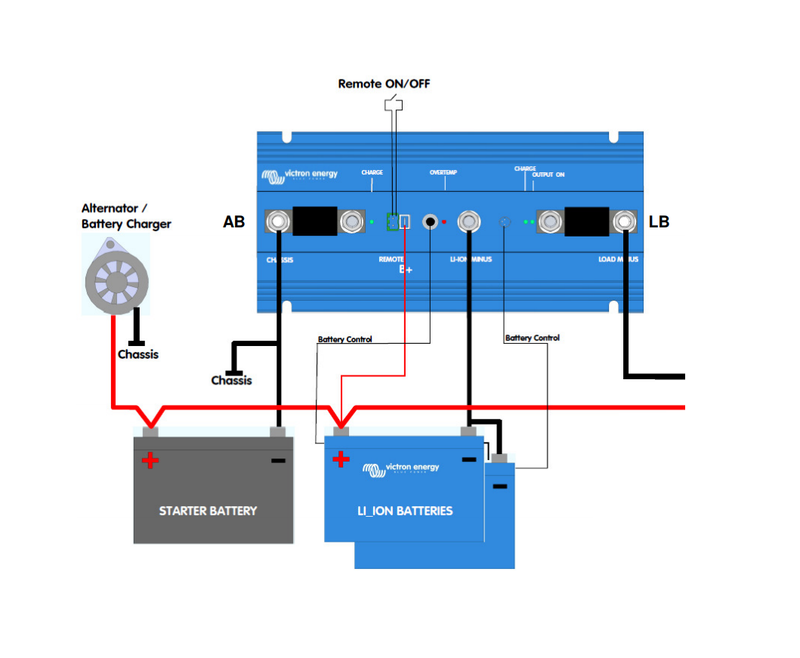 A discussion on the best way to incorporate an alternator into a Lithium-Ion battery system. There are a few things to consider when incorporating an alternator into a lithium-ion battery system. The first is: "Is the alternator up to the job?" A Lithium Ion battery can put a lot of load on an alternator and have it working flat out for an extended time. There might need to be some way to limit the demand to prevent the alternator from self destructing. Other considerations include making sure the alternator will charge the lithium battery at the correct voltage and figuring out what happens when the lithium battery is full. You can see in the table above that the 300 Amp Hour battery can accept a charge at up to 750 Amps but the recommended continuous value is 150 Amps or less. As you can see in the table above the recommended charge voltage is 14.0 - 14.4 Volts Most alternators will not be able to get the battery to that voltage until the battery is nearly full. When it does get to the full voltage the BMS (Battery Management System) needs to shut off the charge to the battery. What happens when the battery gets full? When the battery gets full the BMS needs to shut off the charge. One way to achieve that is to interrupt the connection between the alternator and the lithium battery. In this case there needs to be another conventional battery, usually a start battery, for the alternator to charge. You cant disconnect an alternator's output while it is running because with nowhere for the power to go its internal voltage would soar and destroy the diodes. Another way to achieve the same result is to have the BMS turn off the alternator regulator. This is normally only possible with an externally regulated alternator. When its turned off the alternator isn't available to charge any other batteries, such as a starting battery. If you have a monster alternator then it may not need limiting. That would be the kind of heavy duty truck alternator that is designed to run at high output all day. For any other alternator it would be wise to consider some kind of limiting to prevent it from self destructing when charging Lithium Batteries at high output for an extended time. Alternators that have an external regulator with alternator temperature sensing offer the first and easiest way to limit the current. When the alternator gets too hot the regulator dials it down a bit to keep it within the allowed temperature. The latest version of the Balmar MC-614-H regulator offers a continuously adjustable output to keep the alternator within temperature. Other alternators may need some additional external limiting device. The Victron 12/1200 BMS has a built in feature that limits the alternator to a pre-determined output up to 100 Amps. It works by putting a fuse of the desired limit in the BMS. If you want to limit the alternator to 80 Amps you put in an 80 Amp fuse. As the fuse nears its rated capacity it begins to heat up and its resistance changes. The BMS recognizes that and reduces the current accordingly. Using this device requires you to have an alternate battery for the alternator to charge. This 12/1200 BMS can be used as a current limiting device even if it isnt being used as the BMS that controls the batteries. In the layout above the alternator is charging a conventional start battery at all times. 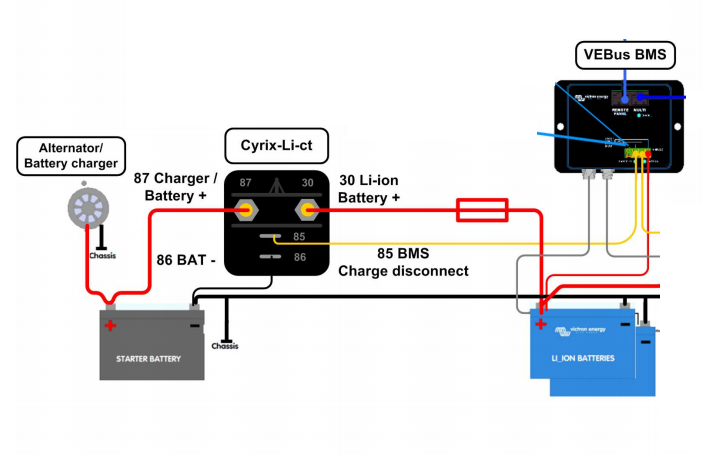 The start battery is connected to the Lithium Ion battery via the Cyrix-Li-Ct which is a battery combiner controlled by the BMS. When the Lithium Battery is full the combiner gets shut off but the alternator continues to charge the start battery. There is no current limiting shown, the alternator had better be up to the job or have active temperature control. In this next diagram (above) the Victron 12/1200 BMS is used and this has a built-in way to limit the alternator to up to 100 Amps depending on what size fuse is placed in the left hand fuse holder. Note that the alternator always has a conventional battery to charge even when its output to the lithium battery is interrupted. The Victron 12/1200 BMS has its limitations though so you might prefer to use the VE Bus BMS. 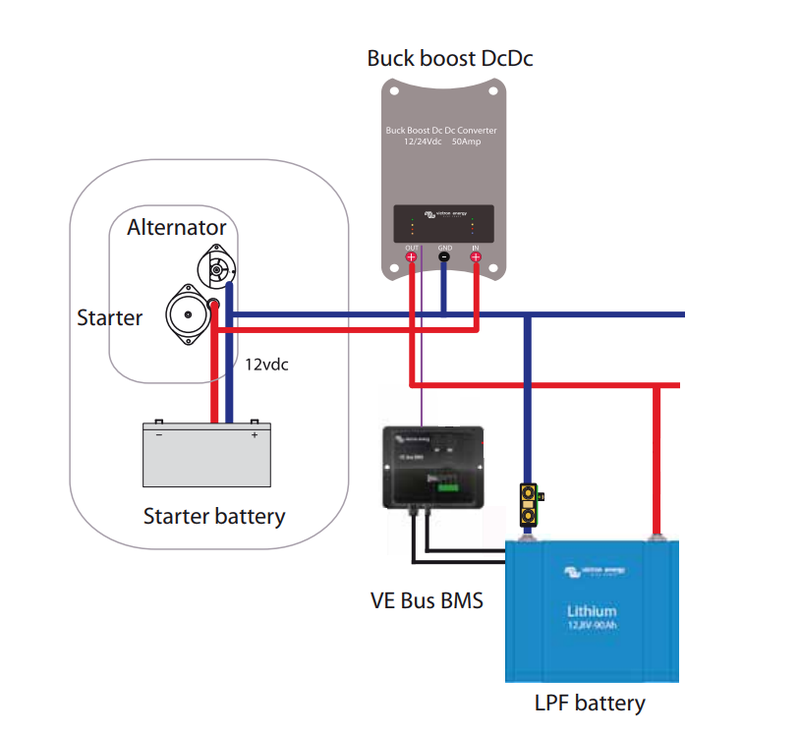 Any system with a Multi-Plus or Quattro inverter charger is going to want to use the VE Bus BMS. The 12/1200 is really for smaller systems and has a limit of 100 Amps on the output side. In that case you can still use the VE Bus BMS as the BMS that is controlling the batteries but use the 12/1200 solely in its function as a current limiter. The wiring diagram would look like the one below. Again, as before, the alternator always has a backup battery to charge. In the next drawing, below, the alternator is only charging the Lithium battery. 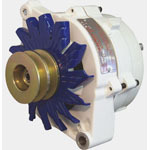 The alternator is externally regulated by a Balmar MC-614-H regulator. The setup includes a temperature sensor on the alternator which limits its output by keeping the alternator within the allowed temperature. It is also possible to limit the alternator to a certain percentage of its rating in the regulator software. The ignition circuit of the regulator is controlled by the "allow to charge" signal from the BMS. When the battery is full the "allow to charge" signal turns off and so does the regulator and therefore the alternator. A small relay may be required to allow the BMS charge signal to interrupt the ignition wire of the regulator. The Balmar Universal Lamp Relay is a suitable small relay for the purpose and you can find instructions on how to use it to control the regulator on its product page. The diagrams on this page are block diagrams to illustrate a concept. They were all taken from published Victron Energy drawings available on the company website www.victronenergy.com They were edited to remove extraneous information not relevant to the immediate topic in hand. In general they don't show circuit protection, battery switches or other similar items. I did have a quesrion about all these systems, what happens when the engine is stopped? Does the lithium battery drain into the conventional battery? Here is the official answer: "The Cyrix-Li-ct will disconnect when the engine isn’t running and the starter voltage starts to drop much like the regular Cyrix. The BMS 12/200 blocks energy from flowing back to the starter battery altogether." Great post! I'm interested in putting lithium on my yacht. I am looking at a brand of lithium which has an internal BMS but no way of communicating information to the outside (as it looks like the Victron batteries do... no CAN bus or extra wires hanging out, just terminal post). In fact i notice this with a lot of LFP lithium batteries on the market. My question is specific to this post and designing a alternator charging system which can accommodate LFP. 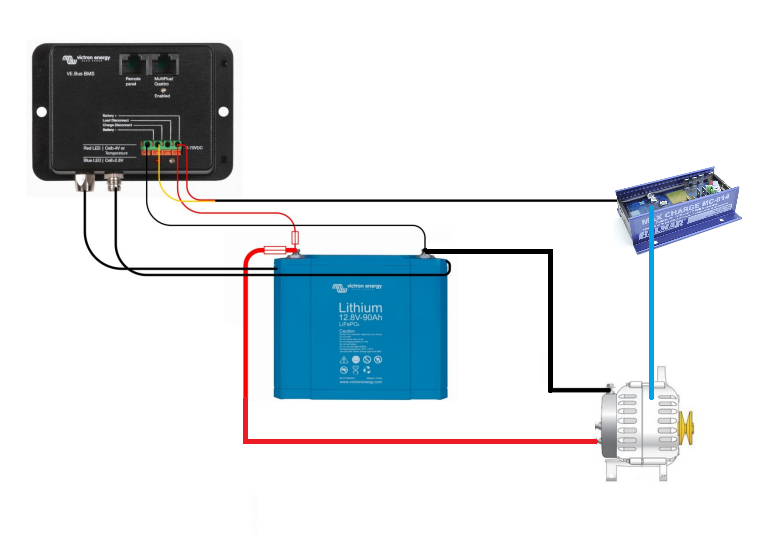 How does the victron VE BMS integrate with batteries without any communication from the internal BMS to the battery? I notice on the bottom of the victron BMS there are some input sources which come from victron lithium batteries, are these a requirement? Any thoughts would be very helpful. Since I wrote this post I have had some second thoughts about using the 12/1200 BMS in boats. It works by controlling on the negative side of the circuit, and if you get into the small details it requires you to isolate the grounds of everything else on the boat. The bigger the boat the harder that is to achieve and I have come to the conclusion that it isn't a very good option for anything except boats with outboards. To answer to comment above: Victron Batteries with their external BMS give you much more options to build a fully integrated system. When you try to replicate this using other batteries that have an internal BMS it is much harder to achieve. I spend a lot of time trying to help people out with this and some of the Victron components are very useful but they still don't give the same level of control as when they have access to the BMS. 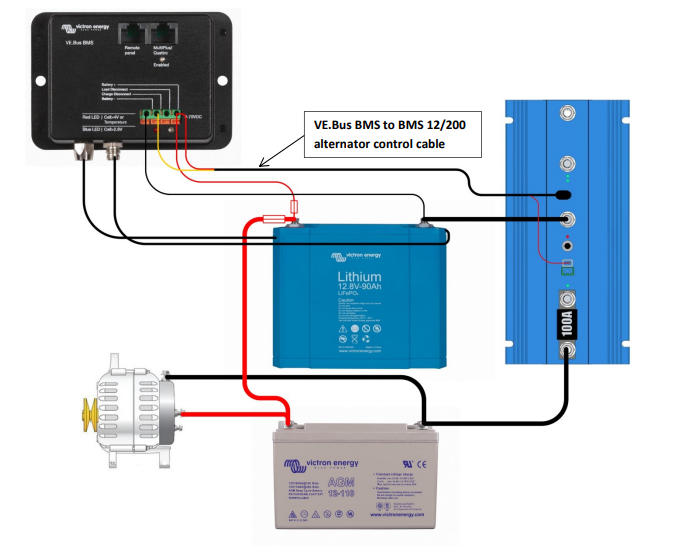 Below are a few ways you can use Victron products with Non-Victron batteries: The Victron BMV energy monitors can be programmed with alarms and an external relay circuit to either operate on voltage alone or on state of charge. You can use their output to control loads and charge sources. You would require some external relays in addition. Because they are just looking at the voltage of the bank as a whole and not at an individual cell level it doesn't give quite the same level of control as you get with an external BMS. That would require you to set the parameters to give you more cushion. The effect of that is you have to shut off the charge a bit before the battery is full and shut off the load a bit before it it empty, giving a bit less capacity than the rated while still protecting the battery. The Victron Battery Protects can be programmed to be relays controlled by a signal from the BMV Energy Monitor, so they can be the relays described above to shut off the load or the charge. They can also be programmed to act on their own and shut off when the voltage drops below a preset level. Regarding the second diagram, and Ryans question. Will it be possible to limit the flow of current from the altenator with the Victron 12/200 BMS with Non-Victron batteries (no battery control wires connected), or is the Victron 12/200 exclusively for Victron batteries? I need it as a current limiter to solve altenator heating problem when charging LiFePo4. Thanks in advance. Yes, when you connect a Lithium Battery to your alternator the charge voltage will drop to just above the battery voltage and will only rise slowly until the battery is nearly full. The battery in this case is such a big load that it determines the outcome. You can liken the effect to connecting strings of lights to a portable generator. The more lights you add the dimmer they get. Eventually if you add too many it will give up! Thank you!!! Exactly the information I was looking for!!! I want to use a buck boost dcdc On a 2500 Ram Promaster and it has a 180amp alternator in it. Would I need to upgrade the alternator to a 220amp? and if i can use the 180amp would it hurt it at all. The Buck Boost DC DC Converter is self limited to 50 Amps although you can use more than one. Its unrealisting to expect a nominal 180 Amp alternator to actually put that much out on a continuous basis. Alternators are rated under the most favorable circumstances (when they are cold) but once they get hot the performance drops off considerably. The Buck Boost DC DC Converter acts like a charge relay in this case. You can program how it behaves, for instance you can use its built-in vibration sensor so it only turns on when it senses that the engine is running. This feature was added so you could install it with a minimum of interference to the vehicles wiring (and thus avoid any warranty issues). What a great article. Is there a way I can contact you for (paid) input on an install? 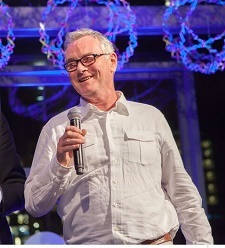 Hello Peter, I was an early 2012/13 adopter of LF04's with an external custom BMS by Demitri when he was still building them. My system incorporated starting batteries as buffers for alternators in the event the bank was isolated form an LVC or HVC event. alternators were controlled via MC614s . ONe issue I hadn't realized until doing some testing was that when I isolated the bank and the alternators kept boosting voltage as the regulator could not sense any battery voltage so kept increasing voltage trying to charge the batteries blindly. The carefully dedicated voltage sense wires (of equal length) were run directly to the LFP04 bank (with twin Victron multiplus 3000's)and once bank was isolated could not provide charging(effect) feedback information. I am not an electrician but was told that accurate voltage sense is critical to accurate charging as just and few tenths voltage sense differential has a huge impact. What would you recommend as a work around to have best most accurate. voltage sensing for both the main bank and the buffer(starting batteries especially if an isolation event occurs underway. I no longer have that boat .but am upgrading batteries in a new outboard powered boat (to me Rosborough). I shied away from my first choice of lithiums because of lack of knowledge with how to control the alternator issues with the Etec Outboards. Thanks in advance for your wisdom and advice. That is an interesting comment. Where to connect the voltage sensor of the regulator requires some thought. In the top drawing it would go on the start battery because that is the primary battery that is being charged. If the only battery being charged is the Lithium battery then the BMS should turn off the regulator when it is full so there is nothing to sense as it is turned off. If you had some other arrangement you might want to put the voltage sense of the regulator on the load side of the battery system so that the battery protect would shut it off in the event of low battery. I believe the regulator can consume power through that voltage sense connection and you dont want that to bypass the control mechanisms. My understanding was if the voltage sense of the MC-614 was off or disconnected it wouldnt work at all. I dont have a test bench here with an actual alternator so I could use a bit of feedback from others who have tried this. I have a sprinter rv van and will be updating to lithium (I already updated solar using most of the Victron parts and accessories from PKYs last fall). I may go up to 600 amp lithium but am concerned that the possible high current draw my fry the 280 amp Sprinter alternator. I am considering instead of the Victron Cryrix-li-ct to use a 50amp dc to dc battery charger to limit the draw to keep the alternator from being overtaxed. Is that a good alternative? Seems to me the only drawback would be a longer period to recharge. On the plus side, I won't need as heavy a gauge of wire. Advice? In the first scenario (start and house bank separated by Cyrix-Li-Ct) how do you program the voltage regulator on the alternator? It will be charging two different battery types (AGM and lithium) times. I could see using a lithium program due to the fact that most of the charging time will be on the house bank but will that program harm the start battery? The Lithium battery has so much less internal resistance than the AGM battery so most of the charge will go to the Lithium battery. You might as well program the system to suit the Lithium battery as it will dominate what happens. Just at the end of the charge cycle the voltage will rise and you want to make sure you dont allow it to rise above what is allowed for the AGM battery. The last diagram in this post shows the Buck-Boost connected to the VE Bus BMS with a purple trace. How is this connection made? The Buck-Boost documentation shows: 1) a USB connection, which as far as I can tell, is only used to program and monitor the Buck-Boost via the TSConfig Windows software. And 2) Pins 1 and 2. Pin 1 can be used to switch the unit on (in place of the vibration sensor), but the Victron documentation makes no mention of pin 2. Bigger picture, how does the Buck-Boost communicate with the rest of the Victon components? Can the Buck-Boost be turned on and off by the Victron BMS, and if so, how is this connection made, or is charging controlled exclusively by monitoring the house battery voltage? How is the vibration sensor connected to the Buck-Boost (this is not mentioned in the Victron documentation)? What is pin 2 on the Buck-Boost used for? Thanks! The purple wire in the drawing is the "allow to charge" wire from the BMS, it is a +voltage signal that it is OK to be on. This signal only allows it to be on, something else has to actually turn it on. The input terminals of the Buck Boost are programmable so you get to choose what you want them to do. In the scenario described above both the "allow to charge" and whatever "turn on" signal you have programmed have to be active for it to run.